You are probably in love with lemon chicken and lemonade, but the fact is that your skin loves the lemon juice even more. This sunny yellow fruit is full of nutrients that are vital for the skin when applied directly. Because of the significant amount of Vitamin presence in the lemon, this fruit can be used to give your skin a real treat. So, how to use lemon properly to get optimum result? Lemon juice is packed with natural nutrients and thus it has various benefits on skin. However, the acidic characteristic is irritating for some specific skins, so, it is a good idea to dilute the juice by mixing some water before you use it on your skin. Lemon juice has the tendency to diminish the age spots. To get better results, you should apply this juice at bedtime and leave it to work on your skin overnight. If used at the spot where there is a scar due to some disorder of the skin, it is possible to eliminate the scars. It is not a quick process, and you need to maintain a regularity for a certain amount of time to get the results. Lemon has natural antibacterial property that helps in healing acne and also prevents any further damage. However, if you have applied lemon juice to cure acne and on the blackheads, then remember to wash off your face after use. Citric acid is a natural solution to remove the layer of the dead skin from the face thus the regular use of lemon juice lighten the skin and gives a better skin complexion. How to use lemon juice on the skin? Lemon juice can be used in a different way and for a different purpose. Lemon Exfoliant – Homemade: Take a small bowl and blend one tablespoon of lemon juice and two tablespoons of brown sugar and one white egg. Mix it properly and apply it on the face and scrub the mixture properly on the face. After ten minutes of application, clean the face with lukewarm water and then moisturize. Natural face wash: Lemon juice can be used as a natural face wash by mixing it with water, honey and aloe in equal parts. Apply this mixture on the face in the morning instead of water then rinse with water. Lemon mask for dry skin: Lemon mask can be made at home very easily by blending one tablespoon of powder milk, lemon juice, honey and an oil of your choice and apply this mask for 20 mins. This will lighten your skin and is very useful for dry skin. Lotion: You can prepare a lemon lotion at home by mixing two parts of lemon juice and three parts of glycerine. Apply this lotion before bedtime and let it work on your skin overnight. Clean your face with water in the morning a see an instant glow. A mixture of lemon juice, honey and olive oil in equal parts can be used as a moisturizer and can be used in the dry areas of the skin. Leave the moisturizer for 10-15 mins on the skin and then wash the face with fresh water. You can use lemon juice in some parts of the body such as knees, elbows, and heels to eliminate any discoloured or roughness from the skin. Mix one tablespoon of lemon juice, one tablespoon of witch hazel, one tablespoon of water and two tablespoon of vodka and apply this mixture on the oily skin to remove oil and to tone-up your skin. Lemon juice can be used on the blackheads to reduce their occurrence and to reduce their adverse effect. To do so, apply the lemon juice before bedtime and let it be on the skin for the entire night. Clean your face with fresh water in the morning. A mixture of one tablespoon of honey with few drops of lemon juice and almond oil can be used on the skin to get rid of wrinkles. Apply the solution on the face and leave it to work for 15 mins and then rinse it off with cold water. Cut a piece of lemon into quarters and take a piece and dip it into white or brown sugar and then scrub the face with that piece of lemon to get rid of the dead skins from the face. Alternatively, you can also mix lemon juice, water and sugar and make it a paste and rub it on the face and then you can rinse the face with cold water and apply moisturizer. The presence of natural antibacterial ingredients, the lemon juice fight against the bacteria that causes the acne. To use lemon juice to eliminate acne, dilute the lemon juice with water or use the lemon juice directly on the skin. Take two tablespoons of lemon juice and use it on the acne. Leave out for the overnight and wash the face in the morning with cold water. Although, lemon juice is a natural remedy to cure many skins related problems, still you should follow some tips to avoid any discomfort and to get the best result. The citric acid in lemon causes irritation to the skin for many people and thus if you face any such irritation then you are advised to dilute the lemon juice by mixing some water. Lemon juice makes the scenario worse if someone has dry skin. 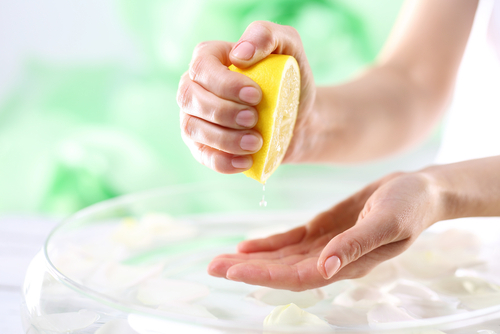 The person must use some moisturizer immediately after using the lemon juice on the skin. You can also mix lemon juice with honey which works as a moisturizer. Do not use the lemon juice too frequently which may increase the dryness of the skin. Limit the applications of lemon juice to 3/4 times a week. If you are undergoing any tropical treatments for your skin, then it is a good idea to consult with a physician before you start using the lemon juice as lemon may interface with these medicines. If you are using lemon juice for your skin, then avoid any prolonged exposure to the sun as your skin becomes more prone to sunburn.